• NEC Article 690.53/ 690.54/705.12 which describes the Photovoltaic power system requirement for DC/AC/ Dual power sources in an excellent detail. NEC Article 705.12(D)(2)(3)(c) deals with AC combiner panel. The solar combiner enclosure specification would be chosen based on the behavior of the environment at the target geographical location. The enclosure specification will follow the local, national or international standards and in minimum will include the following parameters. 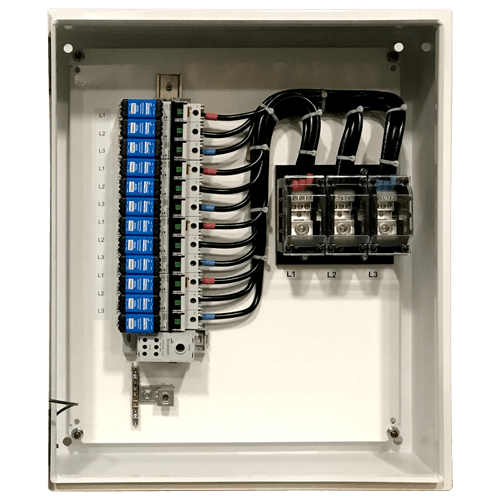 • The DC or AC combiner panels shall have proper disconnects\ circuit breakers installed to make sure that isolation / de-energization / disconnection could be performed in the events of fire. • The final AC/DC combiner output shall be connected through a disconnect which shall be located in an easy to access location for first responders.